The art of tattooing dates back to ancient times when people covered their bodies with various symbols of protection from evil spirits, jinx, and other negative and harmful things. Despite the passage of several millenniums, the spiritual tattoo hasn’t lost its popularity in the present day. However, modern amulet tattoos are majorly valued more as an outstanding design to beautify the body, rather than a symbol able to lead you through life, protect, and assist. Nevertheless, no matter if you believe or not in the magic power of spiritual tattoos, they do have it. So that it’s always a good idea at least to check the meaning of the tat before getting a tattoo. By the way, to celebrate the origins, J&B decided to make tattoo on 25 unique bottles, creating limited tattoo edition of J&B Whisky. Here, below, we’ve compiled a gallery with several ideas of stylish tats, made in up-to-date techniques, keeping all the mystery and spirituality at the same time. The triquetra or the Trinity Knot is a classic Nordic and Celtic sign, symbolizing the connectedness of the sky, sea, and earth. For Christians, this tattoo illustrates the idea of God as Father, Son, and Holy Spirit in one being. Often interpreted as the symbol of eternity, the triquetra protects its owner from any manifestations of evil. The Om is the word, traditionally chanted at the beginning and ending of mantras in Eastern religions. It captures a very deep meaning of the whole universe: the heaven, the earth, and the atmosphere, or the past, the present, and the future. So that the Om exists everywhere beyond the bounds of time, it’s the power of the entire cosmos gathered in one tiny symbol on your hand. The Hamsa Hand comes from Jewish and Muslim communities, but it has become a popular good luck symbol worldwide. The holder of such tattoo expects to be protected from everything negative. In such a pretty purple Orchids interpretation, this ancient symbol will not only “block” the people wishing you no good, but also demonstrate your sense of style and creative approach. Most Asian religions believe in the power of the lotus, which is always pure, delicate, fragrant, and blooms even in muddy water. This beautiful flower of enlightenment is able to create a positive atmosphere around, reflecting all the harmful impulses from the outside, and multiplying your calmness, wisdom, and positivity. The Eye of Horus is the Egyptian tattoo, which helps to cope with the darkness in yourself, protects from troubles and the evil eye, strengthens the pursuit of the divine, as well as directs to achieving the harmony with nature. The Phoenix bird is famous for its out-of-the-world ability to emerge out of its ashes. 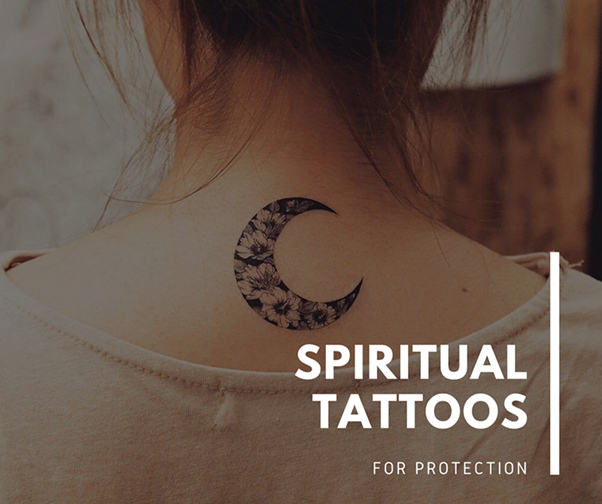 Such tattoos symbolize the sun, rebirth, return to being, and a new spiritual path.It ensures longevity for its owner, protecting from death, and portends a new and happy stage in life. Most often you can find such compass tattoo designs as the Feng Shui compass Luo Pan, the runic compass of Vikings and an ordinary magnetic compass. This tattoo supports in finding your inner compass, choosing the right way – no matter if it’s a real way home or a life path. Such amulet will never let you get lost anywhere. If you add a picture of a spider to such a tattoo, you will get a more powerful amulet. A spider will protect his master from disease and attract health. If you add a spider to such a tattoo, you will get a more powerful amulet, as it’s believed that the spider will protect the owner from disease and attract health. It is advised to get the dream catcher that on the neck or on the shoulder so that it is maximally close to the head, which deals with all dreams and thoughts. Unalome tattoos come from Buddhism, keeping their symbolic meaning of the path to enlightenment. The spiral can be designed in different ways, as well as at the end of it any preferable sign can be placed – for example, the moon, like on this magnificent arm tattoo.